Chitosan is a linear polysaccharide commercially produced by the deacetylation of chitin. It is non-toxic, biodegradable, biocompatible, and acts as a bioadhesive with otherwise unstable biomolecules - making it a valuable component in the formulation of biopharmaceutical drugs. Chitosan-Based Systems for Biopharmaceuticals provides an extensive overview of the application of chitosan and its derivatives in the development and optimisation of biopharmaceuticals. The book is divided in four different parts. Part I discusses general aspects of chitosan and its derivatives, with particular emphasis on issues related to the development of biopharmaceutical chitosan-based systems. Part II deals with the use of chitosan and derivatives in the formulation and delivery of biopharmaceuticals, and focuses on the synergistic effects between chitosan and this particular subset of pharmaceuticals. Part III discusses specific applications of chitosan and its derivatives for biopharmaceutical use. Finally, Part IV presents diverse viewpoints on different issues such as regulatory, manufacturing and toxicological requirements of chitosan and its derivatives related to the development of biopharmaceutical products, as well as their patent status, and clinical application and potential. 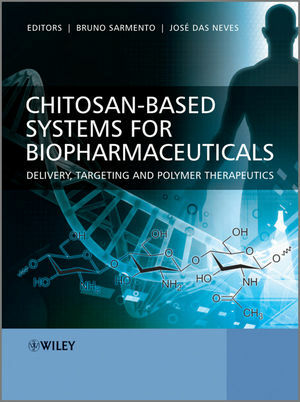 Chitosan-Based Systems for Biopharmaceuticals is an important compendium of fundamental concepts, practical tools and applications of chitosan-based biopharmaceuticals for researchers in academia and industry working in drug formulation and delivery, biopharmaceuticals, medicinal chemistry, pharmacy, bioengineering and new materials development.